What is Retro Modern Style? 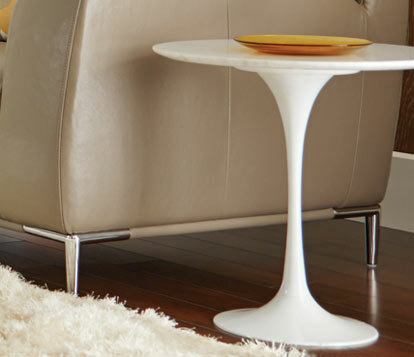 Retro modern furniture blends mid-century and 21st century aesthetics. The style focuses on contemporary patterns, natural materials, and muted colors, such as beige, aqua, gray, burnt orange, and cream. These concepts are integrated into pieces featuring clean lines and gentle curves, and the result is often furniture with a futuristic feel, like egg-shaped chairs and curvy pedestal tables. 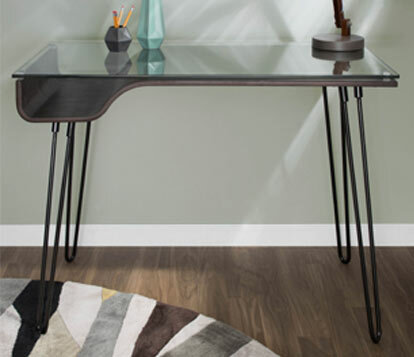 Retro modern furniture is found in many homes and businesses worldwide thanks to television shows like Mad Men, which brought the style to a mainstream audience. Over the past decade, demand has increased for vintage or vintage-inspired chairs, couches, and tables that reflect 1940s to 1970s style. These years saw a surge in organic shapes, natural materials, neutral colors, and simple design. Legendary design couple Charles and Ray Eams heavily influenced the style of retro modern furniture, along with talented individuals, such as Harry Bertoia, George Nelson, and Arne Jacobsen. Today, part of the look's appeal is the nostalgia it inspires. More than anything, people are looking for modest, comfortable furnishings that covertly command attention, and these pieces deliver. 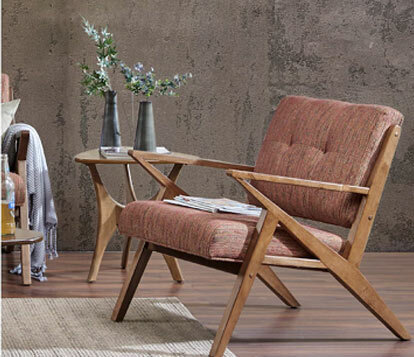 Retro modern pieces favor heavy textural fabrics, such as wool, burlap, mohair, and cotton, although leather, nylon, and polyester are also commonly used. 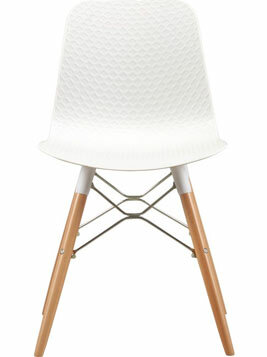 Patterns are often playful, featuring bold geometry and elegant curves. 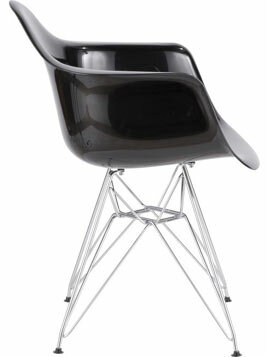 Chair and table frames are typically constructed from fiberglass, steel, plastic, or wood. Bentwood pieces, which featuring stunning curves created from a single piece of wood, are particularly popular in retro modern furniture design for their artistic and architectural feel. Since choosing comfortable pieces that appeal to you may require some shopping around, focus on ease of living and intuitive style when decorating with throwback decor. Budget-minded people don't need to limit themselves to second-hand stores, although they can be good resources. Both online and retail shops offer affordable genuine and vintage-inspired retro modern furniture in all shapes and sizes. Focusing on only a few standout pieces in each room will make them seem more special. The key is to not overdo it. In many cases, less is more when working with such unique pieces. It can be easy to get carried away with all the fun shapes and unique patterns, but focusing on only a few standout pieces in each room will make them seem more special. Budgeting can be challenging, but its's far from impossible. First, consider the size, color, and existing decor of your room, then create a wish list. This will help keep you focused on what you actually want. We all know how easy it is to fall in love with a gorgeous vintage Eames chair, then realize you have no place to put it and not nearly enough money to buy it. 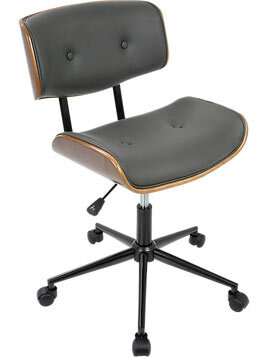 Next, begin comparing prices from retail and online stores to find the best deals on retro modern furniture. Replicas are often more affordable than the real deal, but they may be less comfortable. It's a good idea to buy one or two authentic pieces or invest in well-made vintage-inspired ones rather than choose five or six inexpensive knock-offs. Read online reviews of products you consider, as this can help identify nuances not found in the manufacturer's description. Ask retailers if they have a scratch and dent section, as slightly damaged goods can come with a heavy discount but still work great in many spaces. Another expense to keep in mind is shipping and set-up, as moving teams usually don't work for free. Instead, see if a friend with a truck will spare their Saturday afternoon to help. 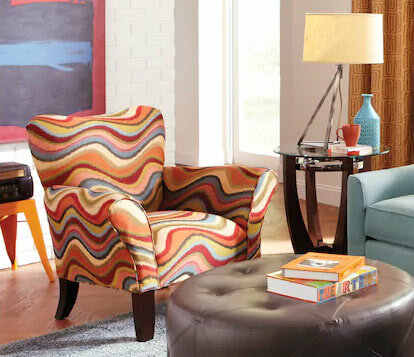 When selecting retro modern furniture, focus on pieces that either match or contrast your existing decor. This is all about fulfilling your artistic vision, so don't be afraid to get creative and try something you haven't seen before in a magazine. Likewise, budgeting doesn't have to be an obstacle. Instead, use this limitation to your advantage. Rather than settling on the first attractive piece, those that shop around not only get the best deals, but often end up with the most coveted finds. If desired pieces are out of your price range, make creative use of furniture that is within reach to create a similar look. Above all, maintain a positive outlook. Buying vintage furniture often means coping with missed deals and drawn-out bidding wars, while trying to find quality reproductions can take a lot of time and patience. Still, you can stay optimistic, knowing that nothing beats the thrill of finally snagging the perfect retro modern piece at an affordable price.